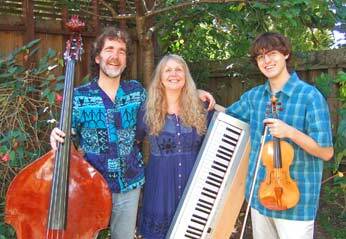 Andy Shore calls to the music of StringFire: Caroline McCaskey, fiddle; Erik Ievins, cello/bass; Patti Cobb, piano. This dance will feature gender-neutral roles (larks/ravens). Everyone is welcome! Partners and dancing experience are not necessary. Each of the dozen or so dance forms during the evening are taught and prompted (except for the waltz and hambo). Beginner’s Workshop: dancers are encouraged to attend the beginner’s lesson at 5:40. Regular dancing begins at 6:00 (dances can get more complex as the night goes on).